Washington is celebrating the opening of a new facility that is revitalizing a long-time historic industry in the city. City and state leaders came together in August to commemorate the opening of Eagle Railcar Services. 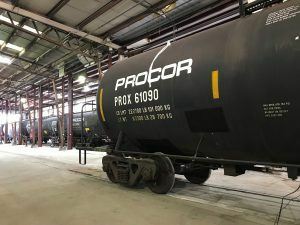 The company is establishing a 150,000-square-foot railcar repair and maintenance facility at the site of a former long-time rail yard. Already, the firm has created more than 100 new jobs. The project is placing Washington and the company in a “strategic position for growth,” Washington Mayor Joe Wellman said. “We are appreciative that the team of the (Indiana Economic Development Corp.), the Daviess County Economic Development Corp., and the city of Washington are able to work together to produce a competitive situation to attract companies like Eagle Railcar and encourage investment and commitment to the region,” Wellman said. Among the incentives, the project utilizes conditional tax credits from the Industrial Recovery Tax Credit (DINO) program. The program is designed to spur investment in former industrial sites, such as Eagle Railcar’s improvements in Washington. The railroad industry plays a large part in Washington’s heritage and put the city on the map, Wellman said. In the 1800s, city officials were instrumental in bringing a rail yard to the site that is now home to Eagle Railcar. Operations hit their heyday in the 1920s with 1,300 employees, and the industry served as an economic engine for the city, Wellman explained to those in attendance at the ribbon cutting. However, with changes to the rail industry over the years, the once vibrant rail yard had begun to decline. Eagle Railcar’s investment represented a game changer. “We are sure that Eagle Railcar will be that rejuvenated economic engine for us,” he said. The Washington project is Eagle Railcar’s first facility in Indiana. 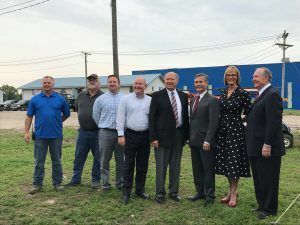 The company, which is based in Texas, invested more than $18 million toward the completion of the facility, which was built on a site that required significant demolitions and renovations. The project comes on the heels of Washington securing another new company. The city has been a frontrunner in developing infrastructure near the newly-expanded portion of Interstate 69 to attract new businesses. And it’s paying off. Earlier this year, the city celebrated a $4.6 million project by M&C Tech Indiana, which represents the first Japanese-owned company to locate to Washington and Daviess County.